homekeyboard_arrow_right In the fieldkeyboard_arrow_right Jordankeyboard_arrow_right First job fair in Zaatari refugee camp! Zaatari is the largest refugee camp in the Middle East, gathering some 80,000 Syrian refugees who have fled the conflict.  Six years after the beginning of what has become a protracted crisis, one of ACTED’s priorities is to improve refugees’ economic self-reliance by facilitating access to income generating opportunities. At the beginning of October, the International Labour Organization (ILO) and UNHCR, in partnership with Norwegian Refugee Council (NRC), the EU and the Syrian Refugee Affairs Directorate (SRAD), organized a job fair in Zaatari refugee camp. This event followed the recent opening of Zaatari Office for Employment (ZOE), which provides employment services, career counseling and issuance of work permits for residents of the camp. ZOE, the Arab region’s first employment office for refugees, has already benefitted over 3,000 Syrian refugees in Zaatari camp. 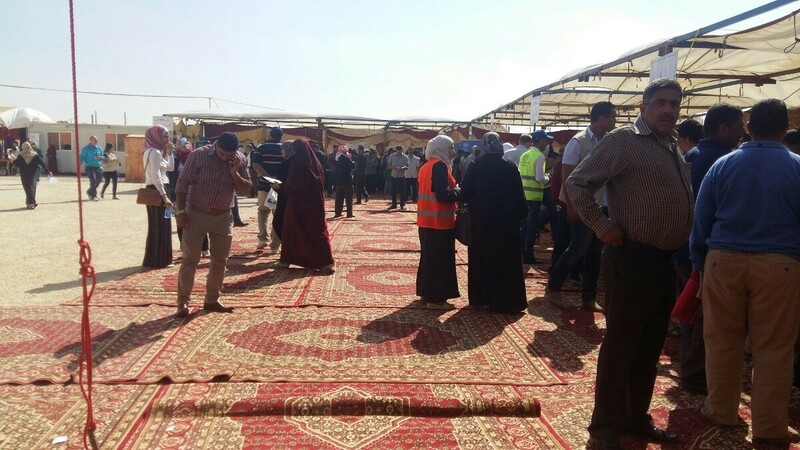 The job fair organized in Zaatari is in the wake of the Jordanian government’s recent decision to allow refugees residing in camps to obtain work permits and find employment opportunities in host communities. “Since early 2016, the Jordanian government has undertaken a number of important steps that facilitate access to formal employment opportunities for Syrian refugees,” said UNHCR Deputy Representative to Jordan. “This job fair is another significant step, providing an occasion for refugees to meet employers and seek meaningful jobs, with parallel benefit of supporting the local economy. The jobs are available for men and women, helping to increase the presence of women in the labour force”. 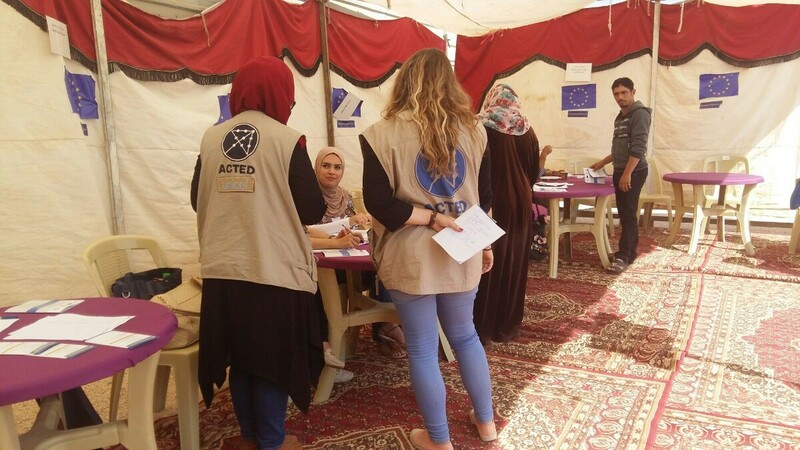 ACTED had widely shared information about the job fair with the Syrian refugees through its activities in the camp. During their meeting with the companies’ representatives, refugees were asked to provide information on their skills, experiences and motivations and could learn about the different positions available in the companies, mainly from the industrial, garment, manufacturing, construction and agricultural sectors. The fair was open to both men and women, and the companies’ representatives were also offering technical trainings and support for accommodation, childcare and transportation from Zaatari to the workplace. Arabella is one of the companies that were represented at the job fair in Zaatari. Active in the sector of water filtration, the company was seeking to hire construction workers on a permanent basis. During the job fair, the factory filled its 25 job vacancies by hiring Syrian refugees. Although salary can differ according to the level of responsibilities and skills, all companies pay their Jordanian and Syrian employees equally for an equivalent position. With the lack of return perspectives in sight due to the violent and protracted conflict, Syrian refugees living in the camps are left without many possibilities to recover a stable life. Accessing a stable employment opportunities in Jordan is a significant challenge. ACTED team also met with a Syrian company: created in Syria, it counts 600 people in Amman and currently offers work opportunities in Mafraq in the food sector. According to the representative, the company is looking to hire both men and women with knowledge of hygiene and food safety standards and regulations. In total, over 1,400 Syrian refugees attended the job fair, some 1,200 applied to job positions and 758 were initially accepted or got an interview. The event was highly mediatized and was attended, among others, by SRAD Director, UNHCR Representative to Jordan, ILO Country Coordinator for Jordan, NRC Country Director and the EU Ambassador to Jordan, who inaugurated the job fair. Syrian children take the lead for a safe sanitation environment in Zaatari!